Our monetary sanctions research team has completed year 2 of our five year project. We have conducted over 380 interviews across eight states with people who have been sentenced to legal debt as a result of municipal and felony convictions. In this report we outline our preliminary findings from these interviews. We found that many people have difficulty navigating the legal process, they have varying legal and economic experiences across the jurisdictions studied and have a range of abilities to pay off their legal debt. All of which leads to difficult social, legal, health and financial consequences. This coming year we will be conducting further systematic analyses of our transcripts. We are also continuing our data collection in the eight states, including observations of court hearings and interviews with judges, prosecutors, defense attorneys, clerks and probation officers. This entry was posted in News, Policy, Research on January 4, 2018 by bsarge. 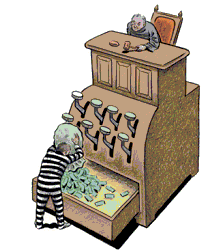 The phrase “criminal justice system” may conjure images of courtrooms, juries and prison. But “when justice is doled out, it increasingly impacts the pocketbook,” according to Alexes Harris, a professor of sociology at the University of Washington. Harris leads a team of researchers at nine universities who are exploring the role of monetary sanctions in the criminal justice system. They recently completed a review of financial punishments in the laws of each of their home states. Based on their preliminary findings, the impact to a person’s pocketbook depends largely on his or her location on a map. Monetary sanctions include fines, court fees, restitution, surcharges and even interest on unpaid sanctions. They are imposed for offenses ranging from traffic violations and misdemeanors to felony convictions. Though these types of financial punishments have a long history in the United States, state and local governments have been imposing monetary sanctions with increasing frequency over the past 30 years. The result is a national patchwork of financial punishments, which Harris and her team are working to blueprint as part of a five-year grant from the Laura and John Arnold Foundation. On April 20th, 2017, the group released a detailed report of the first year of their work, which was a comprehensive review of financial punishments, law and policy across nine states: California (Bryan Sykes), Georgia (Sarah Shannon), Illinois (Mary Pattillo), Minnesota (Chris Uggen), Missouri (Beth Huebner), New York (Karin Martin), North Carolina (April Fernandes), Texas (Becky Pettit) and Washington. These states account for more than one-third of the nation’s 2.2 million incarcerated people. These nine states also are home to more than 40 percent of people in the U.S. who are under community-based supervision. In general, the researchers found wide variation on the fine and fee amounts sentenced to rule breakers, the circumstances in which they’re imposed and even when courts allow people to pay their financial obligations. But all nine states impose monetary sanctions on a routine basis. In some states, the fines are specific: Washington, North Carolina and Georgia have detailed lists of mandatory fees for each offense. Usually, the offense, rather than the person’s ability to pay, determines the amount of the monetary sanction. Harris and her colleagues found that judges and other officers of the court often have little leeway in imposing monetary sanctions. In Washington, judges can waive interest payments on certain fines once the principal has been paid. Missouri courts are advised to consider a person’s ability to pay when imposing certain fines. But these are exceptions. In general, these sanctions cannot be revoked – only paid. “There are few ways to find relief from a sanction once it has been imposed,” said Harris. The researchers also found variation among states and municipalities not just in the size of the monetary fines and the crimes for which they are imposed, but also the consequences for failure to pay. Though debtors’ prisons have long been abolished, courts can still issue warrants for persistent non-payment or impose other penalties. Since people in the criminal justice system are more likely to be poor, the consequences for falling behind in payments can be far-reaching. The absence of a national framework governing monetary sanctions ultimately led to this variation, Harris said. But in 2016, the U.S. Department of Justice went so far as to issue a “Dear Colleague” letter on fines and fees. In 2015, Missouri’s Ferguson Commission noted how monetary sanctions can contribute to inequality in the justice system. As these and other efforts draw attention to the disparate monetary sanction policies across states, they may prompt states to revisit those policies. Harris and her colleagues are building on this initial review by conducting analyses in nine states of fines and fees from state court data, observing court proceedings and interviewing court officers and debtors. Harris’ previous work in A Pound of Flesh: Monetary Sanctions as a Permanent Punishment suggests that these sanctions have expanded as a result of another modern trend in the criminal justice system. The national research team’s endeavors will help resolve the details of monetary sanctions and how they differ among states. They will also examine, among other questions, the underlying question of why monetary sanctions have become such a prominent part of the modern criminal justice system nationally. This entry was posted in News, Policy, Research on April 20, 2017 by bsarge. “Do the crime, pay the fine.” A little different, right? Many are unaware that when convicted of breaking the law, not only do people “pay” for their crimes by doing time, but they are also forced to pay up financially. The costs include court processing, defense attorneys, paper work, and anything else associated with their incarceration and supervision. In fact, anyone convicted of any type of criminal offense is subject to fiscal penalties or monetary sanctions. (If you have ever paid a traffic ticket, for example, you have paid a monetary sanction.) Further, the base fine of, say, a speeding ticket or even a major criminal conviction is just a small portion of the total cost. There are fines, fees, interest, surcharges, per payment and collection charges, and restitution. Until these debts are paid in full, individuals who have otherwise “done their time” remain under judicial supervision and are subject to court summons, warrants, and even jail stays. As a result of interest and surcharges that accumulate on these financial penalties, this portion of a person’s sentence becomes permanent legal debt, carried for the remainder of their lives. And because so many who are arrested and convicted are poor, unemployed, homeless, or suffer from mental or physical illnesses, the fines just pile up—unable to be erased through bankruptcy—and tie them, indefinitely, to the criminal justice system. For them, debt is a life sentence. This entry was posted in Policy, Research on October 1, 2015 by fedwards. The Tri-City Herald of Washington State published a story describing a State Supreme court case that ruled a woman should not have been ordered to use her federal disability payments to pay toward a criminal case. This entry was posted in News on September 22, 2016 by Emmi Obara. Confronting Criminal Justice Debt: A Comprehensive Project for Reform is a collaboration of the Criminal Justice Policy Program and the National Consumer Law Center (NCLC). The initiative aims to bring together and provide tools to criminal justice advocates and civil justice advocates working towards reforming the challenges posed by criminal justice debt. This initiative released three reports today. An overview of the collaboration project. This guide is geared toward attorneys protecting clients from the problems posed by criminal justice debt practices. This guide provides an overview of various areas of law regarding harmful criminal justice debt practices as well as detailed policy reform strategies. For more information on this collaboration, visit their site here. This entry was posted in Policy on September 8, 2016 by Emmi Obara. The Juvenile Law Center, a Philadelphia public interest law firm for children and teens, released a report on Thursday on the issue of monetary sanctions in the juvenile justice system. It provides an overview of the problem, information on eight types of fines and fees, and potential ramifications for youth and their families. This entry was posted in Uncategorized on September 2, 2016 by Emmi Obara. The Juvenile Law Center released a multi-state report on the costs of fines and fees in the juvenile justice system. The report describes the types of financial obligations youth and families face, including the legal and economic consequences of failure to pay. This entry was posted in Policy on August 31, 2016 by Emmi Obara. The Boston Review published an article describing the system of monetary sanctions in the criminal justice system and the historical roots of these practices. This entry was posted in News on August 2, 2016 by Emmi Obara.